This holiday showcases the abundant and diverse wildlife of Costa Rica in all its colourful glory – a technicolour romp through the national parks and reserves of the country! You will come across wildlife everywhere in Costa Rica, but a hotspot worthy of a mention is the Osa Peninsula. Particularly popular are the endearing sloths, relaxing in the branches, barely moving and the four species of monkey found here – always entertaining. More elusive, but still present, are ocelots and jaguars, they are notoriously shy and seldom seen. Costa Rica is blessed with 4 different types of monkey, each one endearing in its own way. 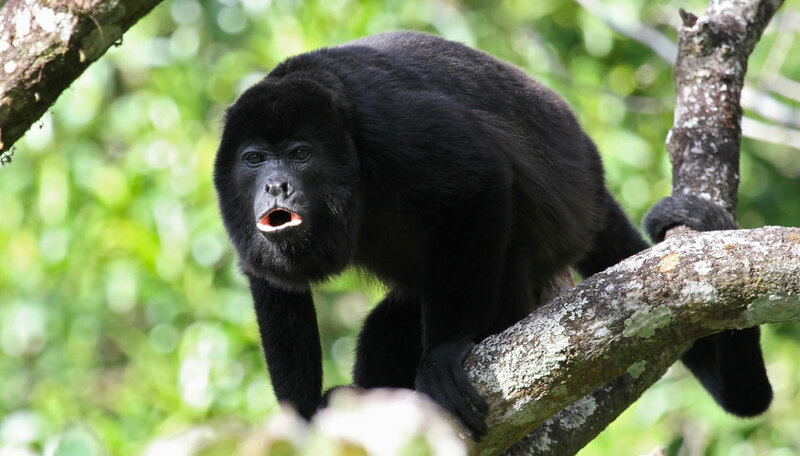 Howler monkeys will announce their presence and you will here their loud call before you see them leaping in the branches overhead. Their call is impressive and not likely to be forgotten as it booms out in the peaceful forest. The cheeky white-faced capuchins are endearing with their white faces full of expression. They are very curious and intelligent and are likely to come close to find out who it is that is looking for them – they may help themselves to any food you have too if you leave your bag unattended. The adorable squirrel monkeys are the smallest and rarest of Costa Rica’s monkeys. They scurry around in small groups searching out insects during the day and are found on the pacific coast. Your best chance of spotting them is in the Manuel Antonio National Park . Last but not least is the spider monkey, swiftly making their way through the trees using not only their arms and legs but making full use of their prehensile tail. They can cover a lot of ground very quickly and are extremely agile. The sloths are a big draw card for wildlife lovers and Costa Rica has both the two and three toed variety. They unusual animals seem very happy with their lot, with what seems like a smile on their faces. They move so little, that their fur can often have a covering of green algae and many moths and insects find their home here. If you do seem one, they will be very obliging and stay still for photographs – not especially for you, you understand, but just because they don’t move much and when they do it is at a very slow pace. Small, brightly coloured frogs often spring to mind when Costa Rica is mentioned, particularly the red-eyed tree frog with its green body and yellow and blue stripes along its side and then orange feet. The most beautiful and fascinating are the brightly coloured poison-dart frogs. The toxic secretions on their skin are their defence, their bright colours say ‘hands off’. Two of the most well known are probably the green and black poison dart frog and the blue jeans frog, named for his bright blue legs. They are beautiful but very much a case of look and don’t touch. This is a well known birders hotspot. With over 800 species of bird present in this small but beautiful country it’s easy to understand why. Some popular and undeniably beautiful birds found here are the resplendent quetzal, the violet sabre-wing hummingbird, keel-billed toucans and if you are lucky, you may see and of course hear the colourful scarlet macaw. But there are many more for you to find in the different areas from kingfishers to eagles – see how many you can identify on your trip. Considered to be a very distant relative of the rhinocerous, although looking more like a cross between a horse and a pig with an elephant type snout, is the tapir. An fantastical creature which inhabits the rainforests of Costa Rica. Tapirs are quite rare but are found in the national parks, particularly Corcovado. Shy and nocturnal, they are likely to hide from humans, so the chances of seeing them in the wild are quite rare, but keep your eyes peeled. As you might expect, there are lots of butterflies and insects in this tropical paradise. The butterflies are the most colourful and sought after. They come in many sizes and colours and put on a vibrant display when flitting from place to place. Probably the best known is the blue morpho butterfly, the underside of the wings are a mottled brown, it’s only when the wings are open that the bright blue display of colour can be seen – spectacular. 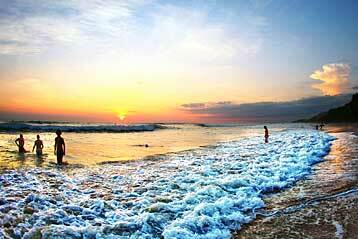 Dolphins are year round residents of Costa Rican waters and can be found off both the Pacific and Caribbean coast. Whilst it is not possible to swim with the dolphins here, any encounter with them is truly mesmerising. On the Caribbean coast close to Gandoca Manzanillo Wildlife Refuge you might see bottlenose, Atlantic and freshwater dolphins. On the Pacific coast, where they are present in greater numbers you could find bottlenose, spinner, rough-toothed, spotted and common dolphins, Drake’s Bay is a good spot for a dolphin encounter.